War in Iraq research papers illustrate that firm lines have been drawn between supporters and those who oppose military action. The war in Iraq was a war against a regime that has no regard for human life, dignity, or freedom. The Iraq War was a war aimed at removing a dictator who poses ongoing threat to Middle East and world peace. When President Bush committed U.S. soldiers to fight, many of whom are too young to buy alcohol, he knew that some would die. Additionally, supporters of the war knew that there would be a high price to pay. Yet all of these individuals also believed that the fight against evil must continue in order to make the world a safer place for all, even those who openly condemned the American action. In the past several years, there has been no act as controversial as the decision to go to war with Iraq. As the United States soldiers continue to die in the drawn-out affair, and as more information is released to the general public about the reasoning for going to war, the country is becoming polarized. There are many who believe that the country should never have gone to war in the first. There are many who believe that war was initially a good idea, but that the war has not gone well, and that it is now time to leave. There are also those who were in favor of the war and are still in favor of staying the course in Iraq; those people include the President of the United States, George W. Bush. Yet, how would the war in Iraq have been handled differently if it were in the hands of some of history’s greatest political minds? Niccolo Machiavelli, Sun Tzu and Baldassare Catiglione were great political minds of their respective eras; how would things have changed if they had made the decisions regarding the Iraq war? The Middle East region has been an area of conflict for centuries. Ever since the Prophet Mohammad revealed the Koran and started attracting legions of followers to a new religion called Islam, there has been tension in the region between Muslims and Jews, Muslims and Christians, and even between sects of Islam, Shiite and Sunni. The conflicts in the Middle East are older than the United States by over a thousand years. The first Gulf War in 1991 came after Iraq had attacked the country of Kuwait. The United States and its allies eventually won that war, placed sanctions on the country of Iraq, and enforced no-fly zones in the north and south of the country. Dictator Saddam Hussein, who was the leader of Iraq during the Gulf War, would again become a major player in the Iraq War. On September 11th, 2001, the landscape of world politics and foreign policy changed dramatically. The attacks on the World Trade Center demanded a response, and George W. Bush responded in a steadfast manner. Bush identified an “Axis of Evil” – nations around the world that sponsored terrorists and their regimes – and Iraq was included on that list. 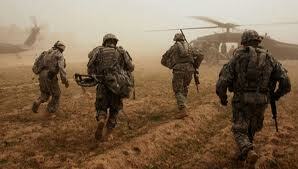 Eventually, on October 11th, 2002, the United States Congress authorized an invasion of Iraq by U.S. troops. The connection between 9/11 and Iraq has always been sketchy at best, and why the United States entered into a war with Iraq has not always been clear. The 9/11 Commission Report failed to find any link between Hussein, Osama bin Laden and al Qaeda; no weapons of mass destruction were ever found in Iraq, and reports of the Iraqi regime purchasing quantities of uranium from Africa were discredited. George W. Bush often said that the invasion of Iraq was a pre-emptive move; to engage in war with the enemy on their turf, before the enemy could bring war to American soil. George Bush - George Bush essays on the 43rd president who came into office in January 2001. George W. Bush - This is research paper on President George W. Bush. His terms as president of the United States of America will be examined. Niccolo Machiavelli - Niccolo Machiavelli research papers cover his political and philosophical ideas in the The Prince. Sun Tzu - Sun Tzu research papers discuss the famous text called the Art of War. Quran and Bible - A research paper on the Quran and the Bible points out that the major difference between Islam and Christianity lies in their religious texts. What is Evil - What is Evil Research Papers delve into the definition of evil along with other issues dealing with this term. Iraq War Coverage - Iraq War Coverage Research Papers delve into an example of an order placed on the comparison of the different types of media covering the war in Iraq. Oil Spills During the Gulf War - Oil Spills During the Gulf War Research Papers delve into the environmental terrorism that Saddam Hussein and his Iraqi forces committed. Cold War Timeline - Cold War Time line research papers explain the events from the beginning and conclusion of the Cold War. Order a research paper on the Cold War from Paper Masters. John McCain - John McCain research papers give a biography of the Senator and look at his bid for the 2008 Presidential Election versus Barack Obama. Economy in Kuwait - Economy in Kuwait research papers explore the economic status of Kuwait after the Gulf War. The USA Patriot Act of 2001 - The USA Patriot Act of 2001 Research Papers evaluate the events of September 11 2001, and the act that came into play shortly after which changed immigration laws among others. Media Bias - Iraq War Coverage Research Papers delve into an example of an order placed on the comparison of the different types of media covering the war in Iraq. Wikileaks - Manning is accused to leaking hundreds of thousands of classified documents relating to the war in Iraq and Afghanistan. Paper Masters writes custom research papers on War in Iraq and illustrate that firm lines have been drawn between supporters and those who oppose military action.